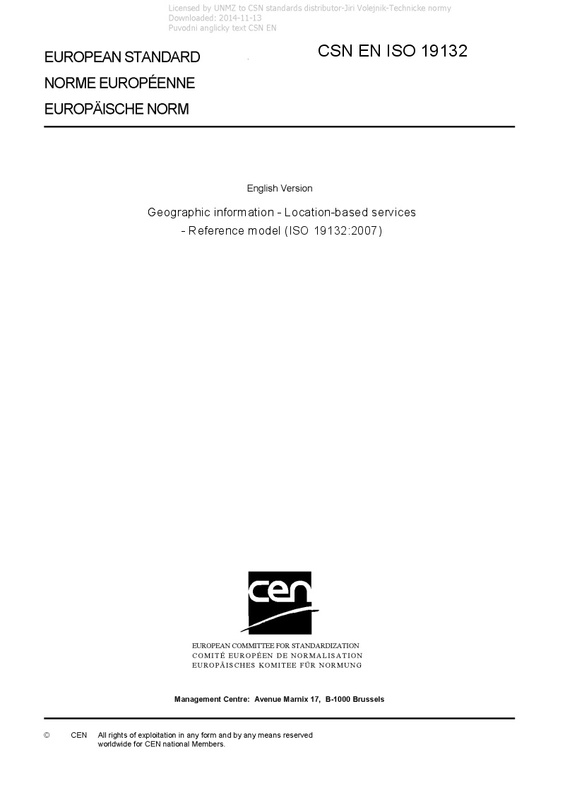 EN ISO 19132 Geographic information - Location-based services - Reference model (ISO 19132:2007) - ISO 19132:2007 defines a reference model and a conceptual framework for location-based services (LBS), and describes the basic principles by which LBS applications may interoperate. This framework references or contains an ontology, a taxonomy, a set of design patterns and a core set of LBS service abstract specifications in UML. ISO 19132:2007 further specifies the framework's relationship to other frameworks, applications and services for geographic information and to client applications. ISO 19132:2007 addresses, for an LBS system, the first three basic viewpoints as defined in the Reference Model for Open Distributed Processing (RM-ODP, see ISO/IEC 10746-1). These viewpoints are the Enterprise Viewpoint – detailing the purpose, scope, and policies of the system; Information Viewpoint – detailing the semantics of information and processing within the system; Computational Viewpoint – detailing the functional decomposition of the system. The fourth and fifth viewpoints are addressed only in requirements or examples. These are the Engineering Viewpoint – detailing the infrastructure for distribution; Technology Viewpoint – detailing the technology for implementation; Reference models and frameworks can be defined at a variety of levels, from conceptual design to software documentation. ISO 19132:2007 defines the conceptual framework for and the type of applications included within LBS, establishes general principles for LBS for both mobile and fixed clients, specifies the interface for data access while roaming, defines the architectural relationship with other ISO geographic information standards, and identifies areas in which further standards for LBS are required. ISO 19132:2007 does not address rules by which LBS are developed, nor general principles for roaming agreements for mobile clients and tracking targets.